Smoky skies and breezy weather didn’t deter thousands from heading to the South Waterfront for TriMet’s Orange Line Fireworks Spectacular Saturday evening. 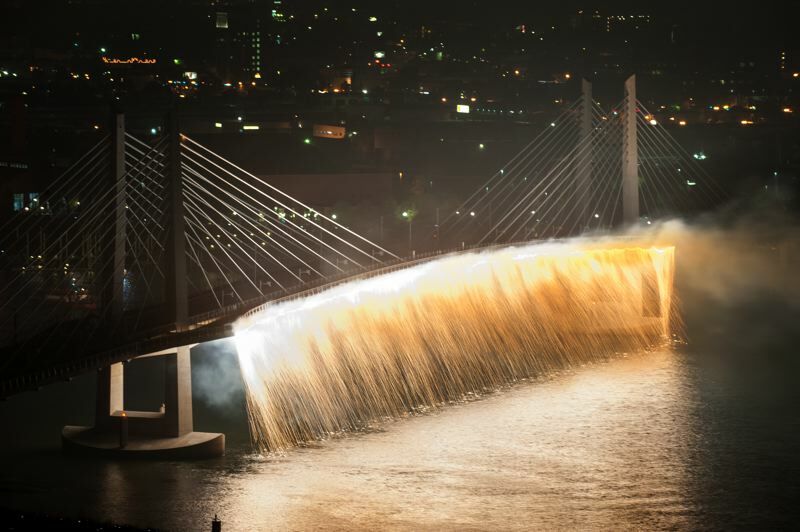 It was expected to be the one and only time that fireworks are launched from the Portland’s newest bridge. Portlander Rich Bader envisioned the show more than a year and a half ago. Kiewit, the construction company responsible for building the Tilikum Crossing, sponsored the event. Tasked with converting Bader’s vision into the 12-minute show was the responsibility of Pyro Spectaculars of Rialto, Calif. It wasn’t the company’s first show on a bridge, having been responsible for the 50th anniversary shows on both the Golden Gate and the Oakland Bay bridges. Thousands of explosive devices were used in the computer-controlled show. It was timed to music broadcast around the show site by All Classical Portland (FM 89.9). 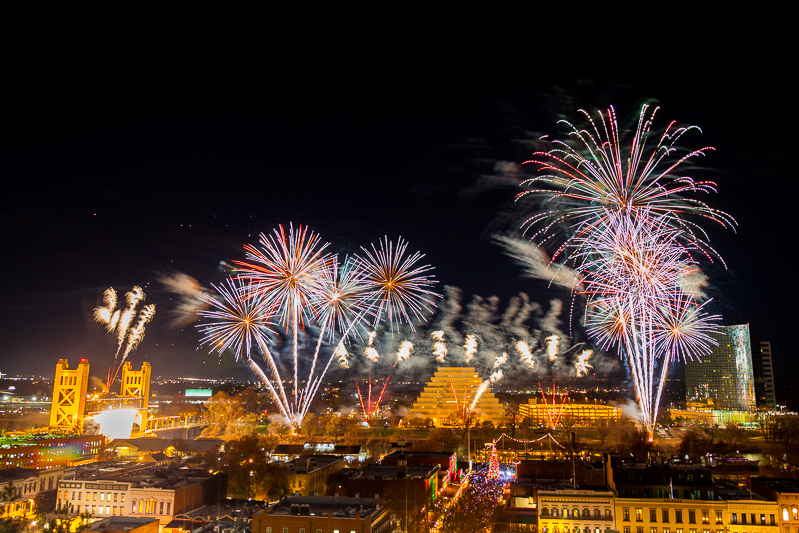 Fireworks ranged “from classical aerial up to 500 feet above the bridge deck to theatrical, instantaneous devices that can create movement across the bridge,” says Ian Gilifillan, Pyro Spectaculars executive vice president. More than 1,300 firing commands drove the show, each firing between one and 100 devices. The show was broken up into five scenes, according to Bader. It opened with an homage to native Americans, followed by images of movement to symbolize transportation. The history of the MAX light-rail systems was shown in a series of different color themes, starting with the Blue line. Introduction of the Orange line put a crescendo on the MAX scene, but it was topped by a spectacular finale, synchronized to celebratory western music. Fireworks were only one part of the evening’s festivities. An orange-themed picnic at Zidell Yards started off the hazy night on the waterfront, with Tilikum Crossing-themed beer from Bridgeport Brewing and Salt & Straw’s special edition ice cream on hand. The TriMet Orange Line and Portland Streetcar Loop open on Sept. 12. Orange Line MAX follows a 7.3-mile alignment through SE Portland and downtown Milwaukie to north Clackamas County. The $1.49 billion project was built on time and under budget, according to the agency. All transit throughout the region, including MAX, bus, streetcar and the Portland Aerial Tram will be free on the opening weekend. If you missed the fireworks, you can see a different light show on the bridge starting Sept. 10. The Tilikum Crossing’s aesthetic lighting system will be switched on for the first time that night. Lighting patterns and colors will be based on the height, speed and temperature of the Willamette River below. 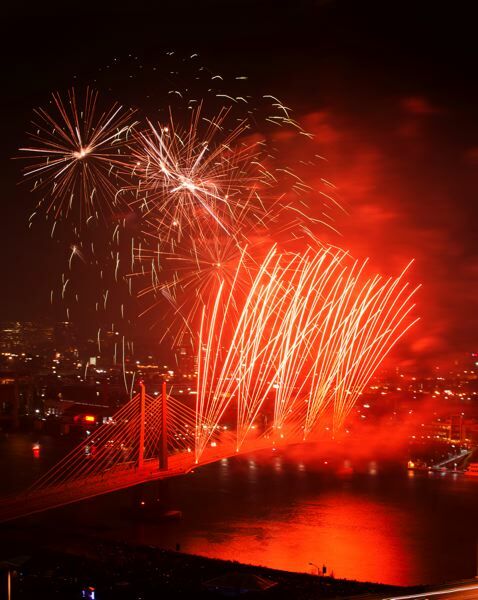 TriMet touts that the fireworks show was one of the largest ever staged in Portland, and it will be once in a lifetime due to the 24/7 operations of the bridge starting Sept. 12. However, Gilifillan says not to talk too soon. “We love anniversaries,” he says.